1.Preheat oven to 375°. In medium bowl, whisk garlic, vinegar, oregano, salt and pepper; slowly drizzle in oil, whisking constantly. Stir in onion and tomatoes. 2.Tear four 12 x 24-inch sheets aluminum foil; arrange sheets horizontally. In center of each sheet, evenly divide half the tomato mixture; place 1 chicken breast over tomatoes and evenly top chicken with remaining tomato mixture. 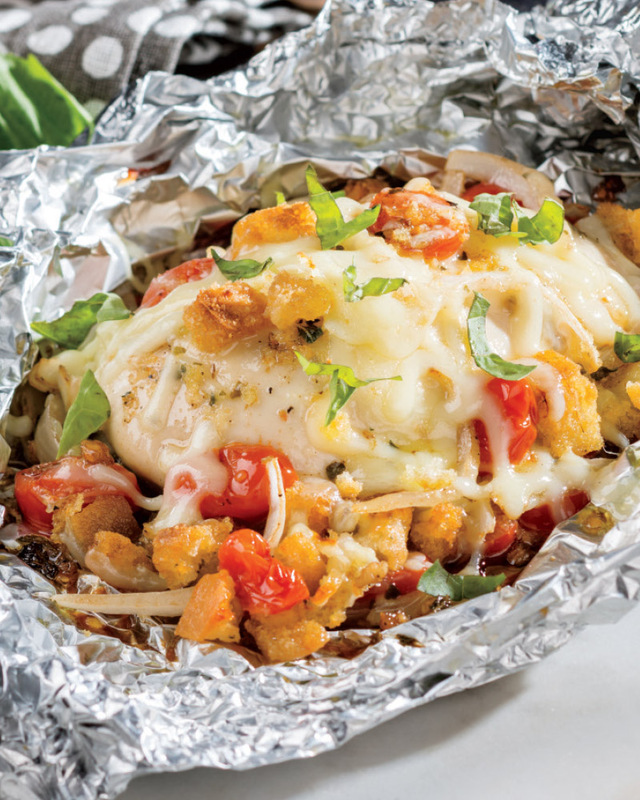 For each packet, tightly crimp top and bottom sides of foil over chicken; fold and tightly crimp both ends of foil. 3.Place packets on rimmed baking pan; bake 20 minutes or until internal temperature of chicken reaches 160°. Carefully open top of packets; evenly sprinkle with croutons and cheese. Reseal packets; let stand 3 minutes or until cheese melts. (Internal temperature of chicken will rise to 165° upon standing.) Open packets; evenly sprinkle with basil. > If you are limited on time, skip step 1 (after preheating oven) and opt for our fresh bruschetta topping from the deli department.